Hiking or Biking + Mycology (the study of funghi) + eat and buy chestnuts, nuts and acorns. In our village you can do many sporting activities complemented with many unique activities equating to a once in a life time experience, with the collection of mushrooms accompanied by an indigenous guide who’s knowledge about this craft is unquestioned. We propose to go for a walk on one of the nature routes that are around from the village and collect mushrooms. On the way back you can eat with us in the restaurants of the town center, you can discover them just by walking through Güéjar Sierra where you will also find various points in which to buy our exquisite chestnuts from the chestnut trees that surround the area, and this is also the case for walnuts and acorns, natural and fresh. 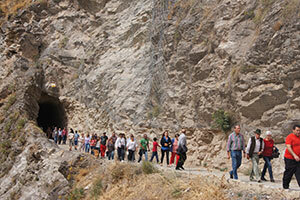 Walk along one of the routes that lead from Güéjar Sierra to Sierra Nevada, similar the tram route. Enjoy the colors of autumn.